Apple has billed ARKit as a means to turn millions of iPhones and iPads into augmented reality devices. The refrain is similar for Kaon Interactive, a developer of product catalog apps for businesses. Kaon's High Velocity Marketing Platform powers product catalog apps for companies like IBM, Oracle, GE, and Dell, among others. The platform serves highly-detailed 3D models for sales representatives to display to potential customers. And, when you deal in large, industrial equipment that does not exactly fit in the back of a BMW (or a Hyundai, depending on the success of the salesperson), such a visual tool can be invaluable. "When we use innovative platforms to connect with prospects and customers on an emotional level, we transcend traditional marketing and sales relationships, resulting in customers who are passionate about what our solutions will do for them," said Gavin Finn, president & CEO of Kaon Interactive, in a statement. Earlier this year, Kaon integrated AR features compatible with the depth-sensing capabilities of Google's Tango platform. Customers are able to view how equipment would appear in their own offices or data centers. Users are able to make moving parts animate, and, in some cases, with a larger specimen, they can even walk inside the machines. However, customers deploying Kaon AR apps did so in limited scope through trade shows or pilot programs rather than invest in a fleet of Tango devices. Now, particularly for companies that practice a "bring your own device" policy, the app becomes a more widely-available tool for their sales teams. 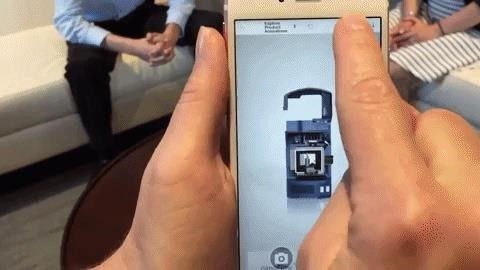 "Apple iOS 11 is a game changer for AR in the enterprise. It is facilitating immersive experiences for B2B marketers on their existing mobile devices, amplifying their customers' receptiveness to key value propositions across the entire customer lifecycle," said Finn.